There are a variety of ways to interact with and use graph data in Neo4j. 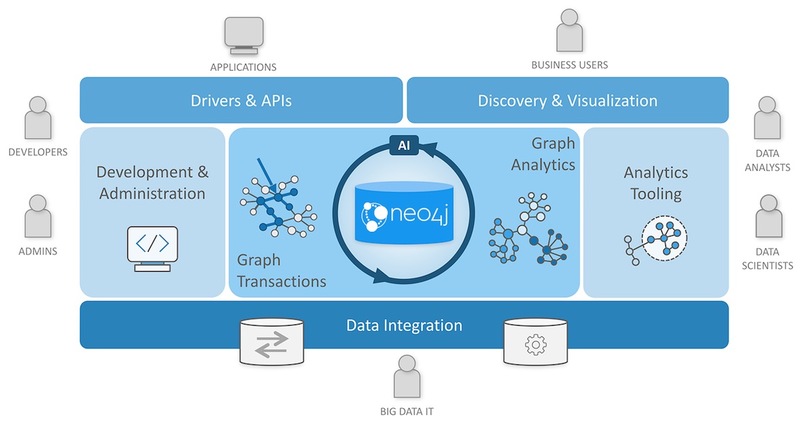 This guide introduces the different products we provide at Neo4j to suit your diverse business and technology needs and show you how to get started using them. From our core product (the graph database) to visualization for business users, we provide a variety of opportunities to maximize your business and simplify your data. Each of the elements listed below was designed to fill a business or technical need in the image above. We continue to improve the different perspectives from which to view data, as well as capabilities of the products themselves. Detailed information and walkthroughs are covered in more detail in subsequent pages of this section, but if you have any questions or issues, don’t hesitate to reach out through the Neo4j Online Community! Neo4j Graph Database – our core graph database that is built to store and retrieve connected data. There is both a Community Edition and an Enterprise Edition. Neo4j Desktop – application to manage local instances of Neo4j. Free download includes Neo4j Enterprise Edition license. Neo4j Browser – online browser interface to query and view the data in the database. Basic visualization capabilities using Cypher query language. Neo4j Bloom (coming soon!) – visualization tool for business users that does not require any code or programming skills to view and analyze data. We also have a variety of extension libraries and developer tools that can be added to existing products to enhance functionality. These will be covered in the Extensions & Integrations section of these guides.